I thought I should describe what I did, for several reasons. First, it’s kind of cool, in a geeky vim-lover kind of way. Second, it’s not something you do everyday, so it’s helpful to have it written down. I’m pretty surprised that I remembered it as quickly as I did. In Vim, pop open the GUI to select the font by typing in this command: :set guifont=*. It should open up the standard font dialog box for your platform. Select the font you want to use and close the dialog. Step 2: Add the Font to Your .vimrc file. Now you need to make the change permanent by adding it to your .vimrc file. Hit enter. The name and size of the font should be appended to the set guifont line you started. Unfortunately, this does a little more than you want. It also escapes the space after set. Take that out manually. 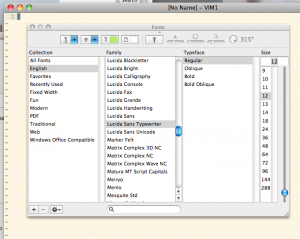 Lucida Sans Typewriter Regular (free with many Microsoft products). Cite this post: Eric Rochester. “Vim GUI Font Magic”. Published August 31, 2011. https://scholarslab.lib.virginia.edu/blog/vim-gui-font-magic/. Accessed on .